Rain Rain Go Away | FULL MOE PANIC!!! but extreme weather brings about extremism in other forms as well such as the following extreme improvisation. 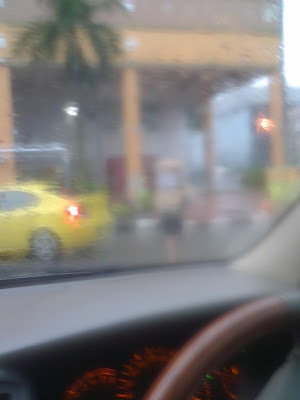 Picture isn’t clear but i assure you that the person in the middle of the road is covering his/her head with a card board box. I suppose you’re not a rain person then. I like the rain, as it makes the weather cooler; but I prefer it in moderation. The rain is good, it washes the evil from you (but only when you’re not getting ill because you’re soaked from head to toe). Love tropical rain, by the way, it’s not crappy cold rain that I have been used to all my life. 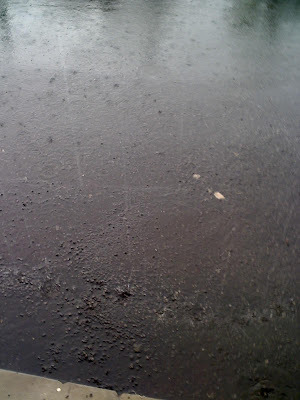 Well… Here rain is much welcome. We usually get snow and temperatures around -10 to -20°C at this period of the year, compared to 9°C at the time I write this (9:46am local time). *Laughs at the cardboard person* No, no mockery. I also hope there are two holes for the eyes, otherwise navigation would be a trifle difficult, especially during that kind of weather. @sylon beta: its no that i hate rain but it always comes at the most inopportune moment like when i am about to leave my house. @D-Blade: -10 to -20?? now that is extreme weather. @choo: i thought you were in Singapore? No, no, that is normal for winter here. If you’re not well equipped when the blizzard blows or foolishly stay outside for too long, you can suffer from frostbite or hypothermia (Don’t worry, it’s not that extreme normally). And if you like snow, there are heaps here in winter (but strangely not much this year). I LOVE rain, ANY RAIN! I prefer cold overcast days with a few showers through the day. Rain where I live is nice to have, though we have been having extreme rain causing floods, traffic, sewer spills, dirty ocean water, etc. With heavy rain comes strong winds which have knocked down electric phone poles that almost killed a man. Btw, I will comment on the comment you left on my blog later, I got the new video of Danny Choo dancing on my blog through his own youtube account, you can get it too lol. @Aya Kyunik: i like cold weather too except for heavy rain that messes up my day. @ AS: sounds just like where i live. There seems to be floods everytime it rains. damn city planners.. Guess hot and humid is too much for me to bear. Well, maybe light showers would be all right, but now it just ridiculous.